Sitting amid 11 acres of forest just 30 minutes outside of Atlanta, Georgia, Kim Cang Monastery is a gem of American Dharma and growing at a rapid rate. 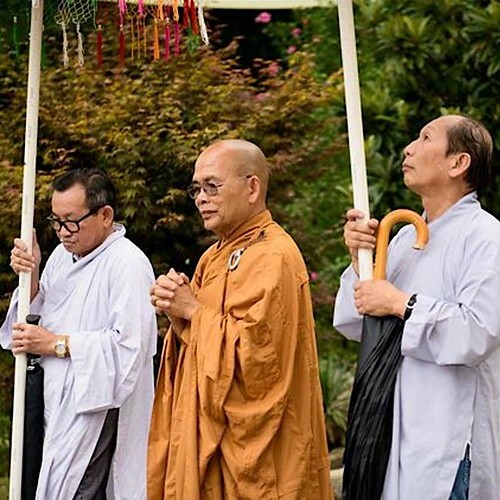 Serving the local Vietnamese Buddhist community while also welcoming those new to Buddhism, Kim Cang was built in 1993 by the Vietnamese Buddhist teacher Venerable Thích Hạnh Đạt. Construction began humbly, with a limited budget, as Venerable first built a small building of some 4,800 square feet. Half of the original building was used as the main hall, with the other half serving as living quarters for monastics, who resided on the second floor. The first floor was used by lay people during retreats, and also housed a kitchen and dining hall. In those early days, services at the temple were conducted entirely in Vietnamese. From the earlier years of Kim Cang Monastery, Venerable grew a variety of organic vegetables, which members of the lay congegation would use to make food to raise funds for the monastery’s development. Today, organic vegetables are still cultivated in a large garden and prepared for ceremonies and functions, and temple volunteers continue to sell the vegetables as means of fundraising. As the temple’s congregation grew, Venerable decided to build a bigger main hall, which was completed in 2007. The current main hall, in the upper level of the new building, totals 5,000 square feet. The lower level of 7,000 square feet houses the kitchen and dining hall, a venue for musical entertainment, space for youth activities, as well as facilities for learning Vietnamese. Kim Cang Monastery has been a place of study and practice for many Buddhists over the last 23 years. At present, two monastics reside on the premises permanently—the founder, Ven. Thích Hạnh Đạt, and Ven. Thích Nữ Đồng Huệ, who ordained as a nun in May 2010. After ordaining at the temple, Ven. Thích Nữ Đồng Huệ spent three years at different Buddhist meditation centers and temples in the US and Myanmar. The purpose of these experiences, encouraged by Ven. Thích Hạnh Đạt, was to help Ven. Thích Nữ Đồng Huệ learn the tradition and to see how Buddhism was being taught elsewhere so she could return to lead retreats and programs for Atlanta’s Buddhist youth. Ven. Thích Nữ Đồng Huệ noted that she was particularly inspired by the engaged Buddhism of Deer Park Monastery in Escondido, California, which was established by the renowned Zen Buddhist teacher Thích Nhất Hạnh. Venerable also trained at Mahasi Meditation Center in Yangon, Myanmar, before returning to Kim Cang Monastery in 2013, where she now resides permanently, assisting the abbot, serving the laity, and leading programs at the Buddhist club of nearby Emory University, where His Holiness the Dalai Lama is a Presidential Distinguished Professor. Indeed it is Ven. Thích Nữ Đồng Huệ’s compassion that drives her work. At the temple, both monastics find balance in their service: “The abbot guides the older generation and I spend my time with the youth and Americans,” she says. Ven. Thích Nữ Đồng Huệ recently initiated temple chanting and sutra study sessions in English each Sunday after the Vietnamese chanting service. To help spread the Buddhadharma in this fast-changing country and to preserve Vietnamese culture, Kim Cang Monastery organises many events and activities throughout the year. Two sitting meditation and chanting sessions are held on weekdays, with repentance ceremonies on the 14th and 30th day of each lunar month. In addition, a short retreat is held once each month, during which Venerable Thích Hạnh Đạt transmits the eight precepts. Attendees stay at the monastery overnight and keep the precepts for 24 hours. The schedule for the program includes meditation practice, studying and chanting sutras, repentance service, listening to a Dharma talk by Ven. Thích Hạnh Đạt, and Dharma discussions. Free vegetarian meals are provided during the retreat. Other temple activities include Vietnamese chanting services and Dharma talks each Sunday. The temple also celebrates three main festivals throughout the year: the Lunar New Year, the anniversary of the Buddha’s birth, and the Ullumbana Festival (sometimes known as Sangha Day). For the children, there is a Moon Festival every September. Two years ago, the monastery also began holding a two-week monastic retreat every July, which this year was attended by 68 Buddhist monks and nuns from the Atlanta area and adjacent states. The two venerables feel strongly that today’s youth represent the future of Buddhism and, as such, they strive to provide guidance and opportunities for young people to study the Dharma and practice meditation. Youth retreats take place every summer and winter, and insight meditation retreats are offered every second Saturday. To cultivate loving-kindness, compassion, and generosity, the youth engage in fundraising and make gifts for homeless families. Such a full, rich blossoming of the Buddhadharma on American soil, just outside a major metropolitan center, is a blessing for this land and its people. With the dedication of the monastics and many volunteers, Kim Cang Monastery will surely continue to thrive and grow. Images courtesy of Kim Cang Monastery.